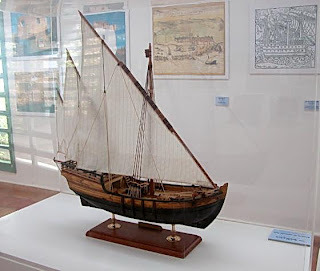 A couple of posts back, I ran comments from reader and blogger António Fangueiro of Portugal about the dhow type known as the buggalow. According to António, the buggalow shows evidence of European influence both in design and in the quality of workmanship which, he says, is considerably finer than that of most dhows. António subsequently sent me these photos, taken in Mozambique, I believe. He says they were published in a Portuguese magazine around 1910, and presumes that the photos were taken considerably earlier. Looking at the foreground vessel in the first photo, I'm struck by the crooked mast, the heavy shrouds, the apparently very light yard built up of two sections and lashed about 1/3 of the way up from the bottom, and the unusually long luff on the settee sail. The vessel in the left background is another buggalow, without a rig. Of course, while there are some similarities, there are also substantial differences between buggalows and caravels, not least being the rig. The dhow rig carries a settee sail, while the caravel carries a lateen. See here for discussion of the difference between these two superficially similar types. Thanks to António for his input. 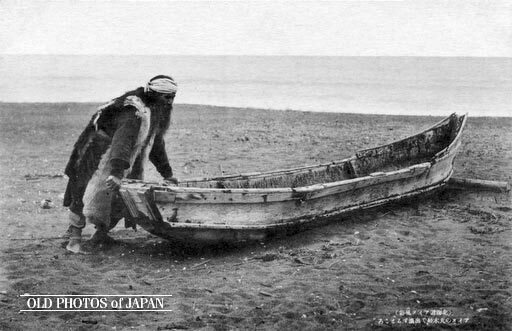 Old Photos of Japan is a fine blog aptly described by its title. A search for "boats" pulls up only a few hits, but they're quite interesting. I won't bother paraphrasing the content; just follow the links to the full articles. Ainu fishermen in dugouts, with very specialized fish spears (photo from 1900s). Lots of detail here. Thanks to Heather Hernandez, technical services librarian at San Francisco Maritime National Historic Park and blogger for Maritime Compass, for passing along this fine resource. Thanks also to Old Photos of Japan. A few weeks back I wrote about the bark canoes of Australia's Arafura Swamp, noting that the design was unique to that area. 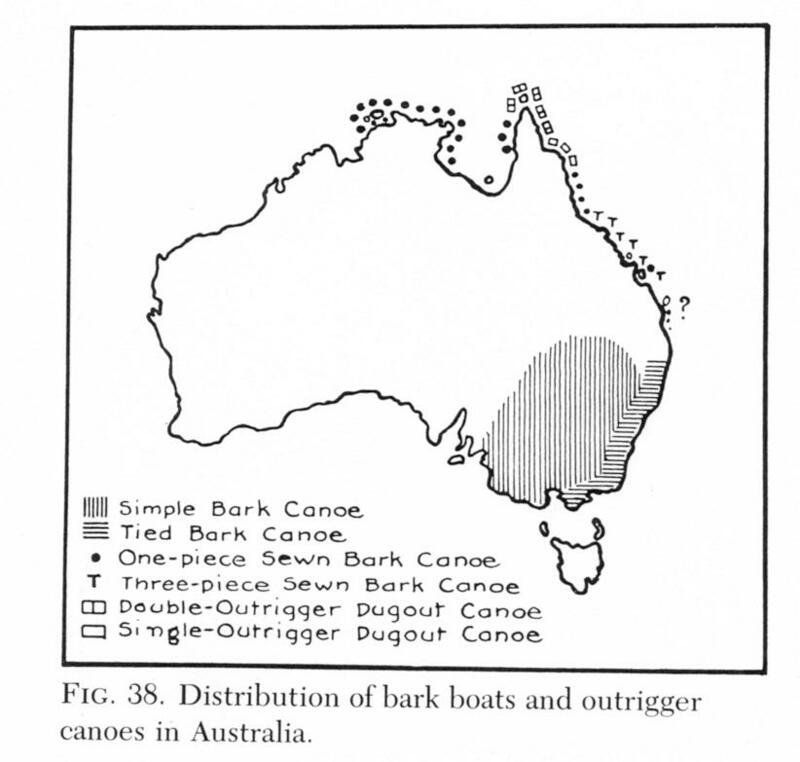 Bark canoes of other styles were used elsewhere in Australia, as shown below in this image from Edwin Doran, Jr.'s Wangka: Austronesian Canoe Origins , which I cited a recent post. As always, the image may be clicked to enlarge. 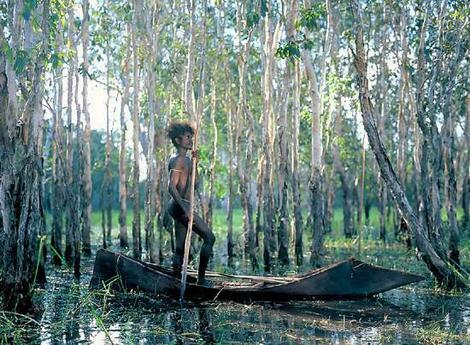 Among the simplest, and presumably most ancient, types of watercraft in Austronesia are boats made of bark. 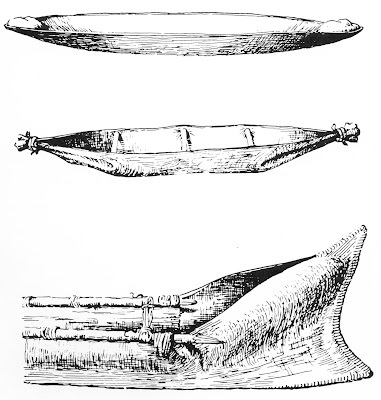 The simplest of all are formed of bark sheets plugged at the ends with clay [top image], whereas others are tied at the ends [center] and more complex ones have sewed ends [bottom]. The principle location [i.e., within Austronesia] of bark canoes is Australia, but a few relicts are found in Indonesia, probably indicating a much wider distribution. The very simple bark rafts of the Tasmanians allowed some mobility on the water but became waterlogged in about six hours and were never used for distances offshore greater than about eight miles. 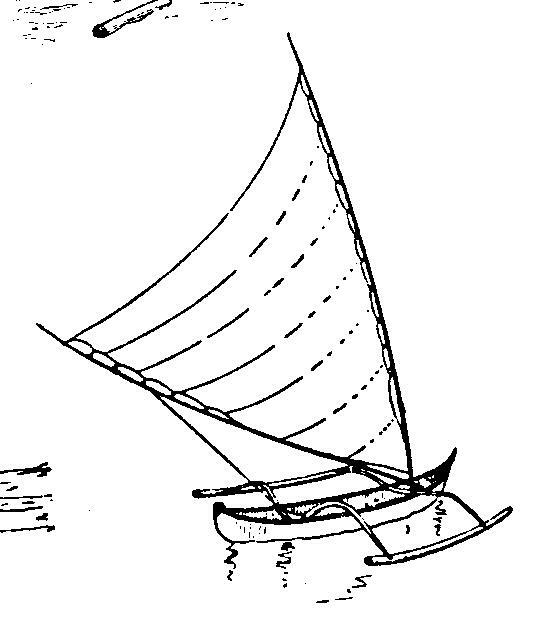 The sewn canoe shown differs from those of Arafura not only in the shape of the end but, significantly, in its having gunwale members lashed to the sheerline. 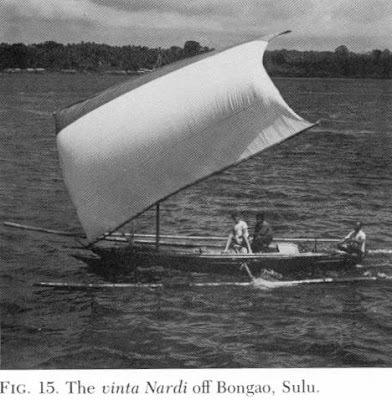 The Arafura boats were entirely without added structural members. 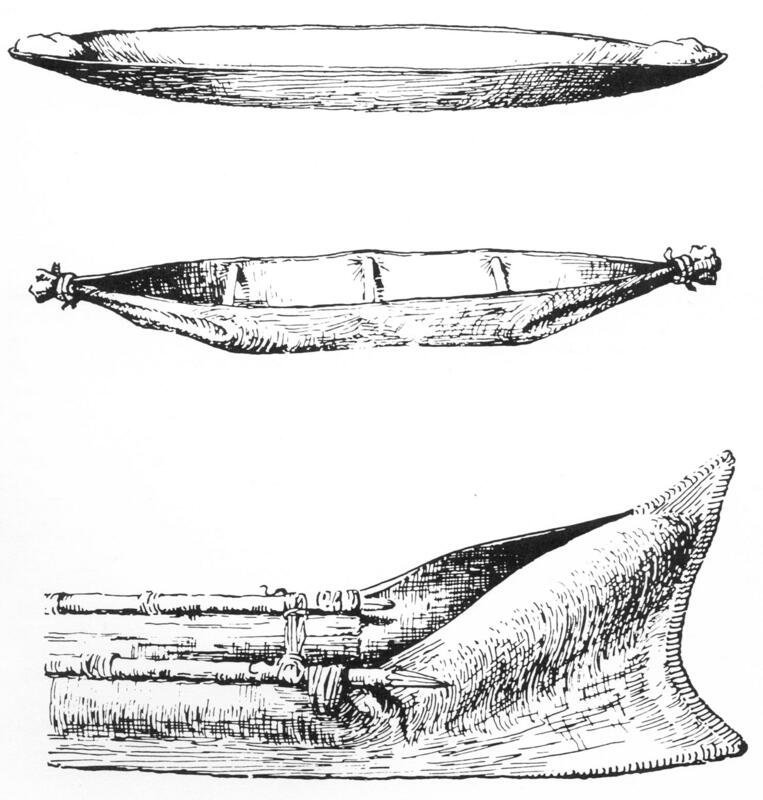 Although Doran says that bark canoes were "Among the simplest, and presumably most ancient types of watercraft" (emphasis added), he is not implying that they are the simplest or most ancient. That distinction he applies to log rafts, noting that true rafts rely on the inherent buoyancy of their material of construction, rather than on a designed, built structure that displaces water. Also in support of his argument: it is a simpler matter to tie one floating log to another, thus creating a raft without any tools at all, whereas even the simplest bark canoe requires tools of some sort to strip the bark from the tree. 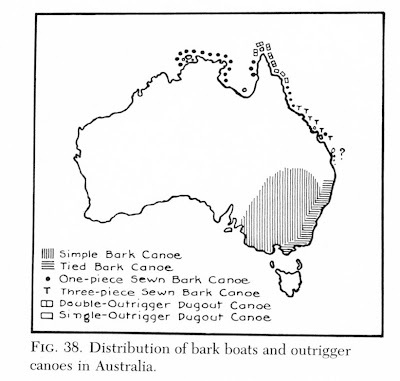 Doran shows the distribution of the various types of bark canoes in the following map, along with the distribution of dugout-based outrigger canoes with constituted the focus of his study. Wonderful blog you have here. 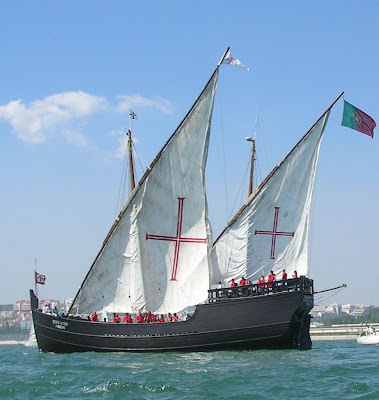 I am portuguese and write also a blog on traditional boats, mainly of Portugal. I do investigation as a hobby on the roots of our boats, and keeping myself between Mediterranean and North Europe is already a huge circle. That´s why this blog of yours is very important, about the "not so glamorous" types of boats of the rest of the world. Many of your articles I could comment, and this one caught my special attention, because of the buggalow good construction and all on board different from the "crude" dhow, thar populated the Indian Ocean for centuries. Calicut, being in the Kerala region of India, has a past of european contacts, more strongly after Vasco da Gama. Looking at the buggalow I clearly see european característics, and although the Dutch and English had also presence in the region, I would say these european fine construction methods arrived and were kept in Kerala by the Portuguese positions there after 1498. 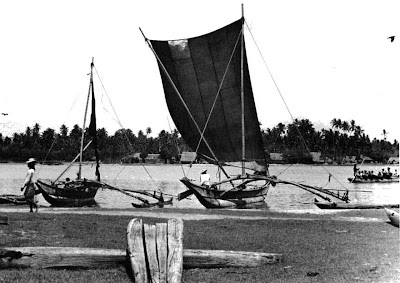 I have an article prepared to publish in the future which makes me believe even more strongly in this Portuguese influence in Kerala boats, this time in a Kerala fishing boat, lauched from the beach and with a half-moon shape. This boat is almost the same as the ones in central Portugal coast, the "barco-de-mar", considered very ancient in their roots, possibly of Greek, Phoenician times and their colonies in Iberian coast. Even the method of fishing used is the same as in Portugal, pulling the nets from the beach. I may send you some pictures about these two examples of boats in Portugal for your analysis. Antonio's blog is extensive and looks very interesting, and Google's automatic translation function makes it somewhat intelligible to non-Portuguese speakers. Antonio -- Thanks for your comments. Although I can't promise a well-informed analysis, I (and, I think, my readers) would be very interested in seeing the photos. Feel free to send them here. 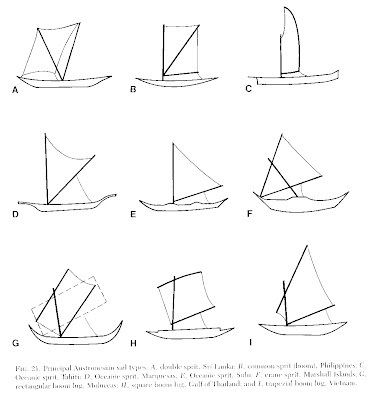 Dozens of rig types have been identified in Austronesian maritime cultures (see this post for an illustration showing a large selection) -- so many, in fact, that it led to confusion and dispute about which types were related to, or ancestral to, others. And since anthropologists often view the diffusion of technology as a means of analyzing cultural origins, that confusion served as both cause and effect for disputes about how the Pacific came to be populated. A. Double spritsail. Confined to a few locations in the Indian Ocean at the time of publication (1981). Both spars are sprits -- there is no mast on this rig (and arguably, none on any of the sprit rigs described). 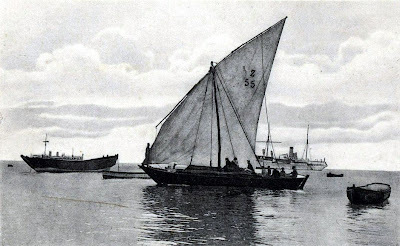 As shown in the photo below, both sprits hold up only a corner of the rectangular sail. 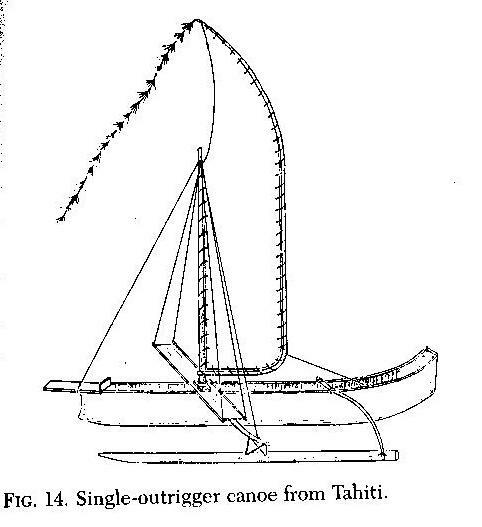 Possibly the grandfather type of all Austronesian sprit rigs. B. Common spritsail: rig appears with and without the boom. Essentially identical to the European sprit rig. 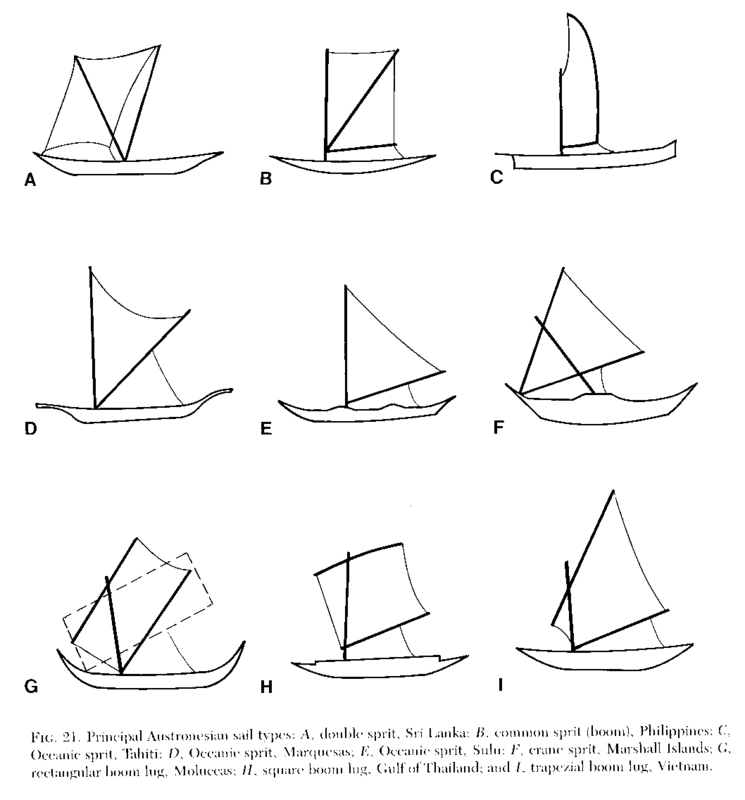 C., D., E.: Oceanic spritsail: D and E differ only in the angle of the after sprit, which, if horizontal enough, can be termed a boom, as in E. Type D, pictured below, was by far the most common at the time of writing. F. Crane spritsail: The word "crane" is being used like the hoisting machine, not the bird. Dorran argues persuasively that this is not a variant of the lateen sail. Where all the other rigs shown here are "tacking" rigs, this one is the famous Pacific "shunting" rig. 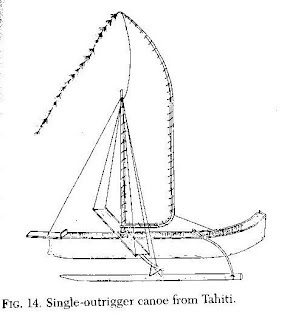 The additional spar pivots fore-and-aft at the base, so that the entire rig can switch ends in the boat, allowing the canoe to switch directions relative to the wind while always keeping its (single) outrigger float to windward. In the photo below, there is a platform on the boat's lee side, on which crew (in this case) or cargo can be placed as a counterweight against the outrigger. Dorran believes these three are closely related, and that the different sail shapes represent a fairly minor distinction. He includes the term "boom" in the name to distinguish them from lugs without booms and from those with sail battens (i.e., Chinese junk-style sails). All illustrations in this post are from Dorran, except of the double sprit rig photo, provided by boat designer Michael Schacht, editor of the blog Proafile, about all things proa. Many thanks Michael! 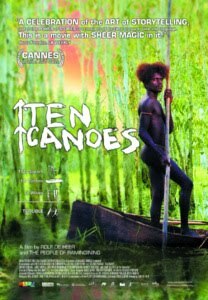 The 2006 movie Ten Canoes by Rolf de Heer is a mesmerizing look at the pre-European-contact culture of Australia and well worth viewing even if it didn't feature indigenous boats. A story-within-a-story within yet another one, they're all set in the Arafura Swamp in Arnham Land, in what is now the Northern Territory, on the northwestern shore of the Gulf of Carpentaria. 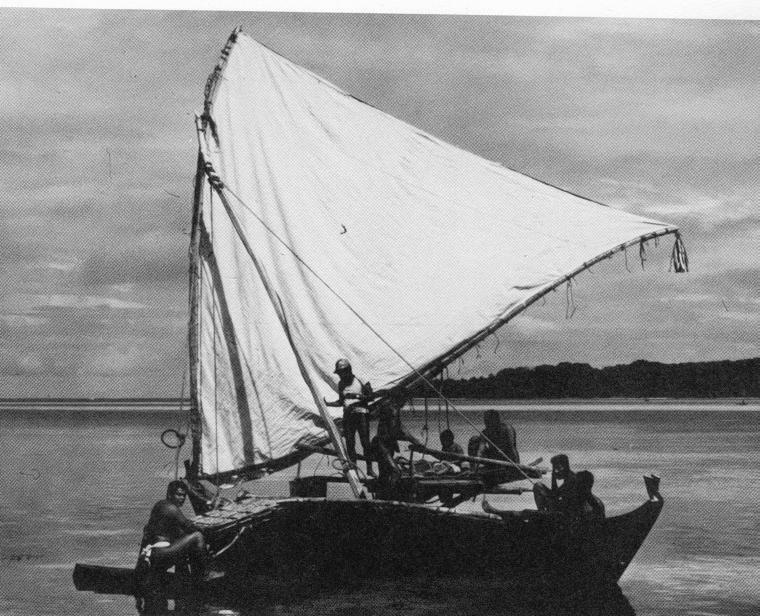 Director de Heer's inspiration for the movie came from a 1936 photograph by anthropologist Donald Thomson, that showed 10 solo bark canoes being poled through long grass in the swamp. The story was built around that image, but when he showed up there to film, seeking local craftspeople to make the props, and local residents -- all of them Australian Aborigines -- to fill all the movie's roles (none of whom had any acting experience), de Heer found that knowledge of the swamp's indigenous canoe had disappeared from the region. 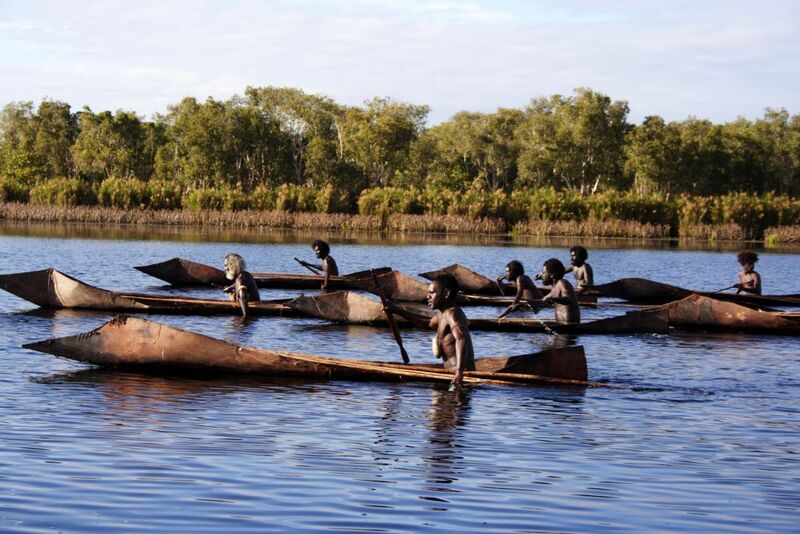 de Heer was able to recruit one individual with some bark canoe building experience from a neighboring district, but as his first canoe began to take shape, it was clear that its design was not that of the Arafura Swamp as photographed by Thomson. So combining the technical skills of the experienced builder (whose name was Pussycat, and who is pictured below) with Thomson's detailed drawings and photographs, de Heer was able to guide the process and build the ten canoes needed for the movie with probably a fairly high degree of accuracy. Certainly, if Thomson's book constitutes the only careful documentation, it might be impossible to come up with a more accurate reproduction, since native knowledge of the type vanished two or three generations ago. I haven't seen Thomson's book (nor do I know its title), but I was able to make out the following details from the movie, which shows certain steps of the building process, and the DVD's "special feature" (far more interesting than most) that shows more of it. Bark is removed from the standing tree (type unknown) by first stripping vertical fibers, then making a long vertical cut, and prying the bark from the trunk with long poles. The bark is far rougher and stiffer than birch: when it comes off the tree, there is no tendency for it to fold over. Instead, it retains its longitudinal shape, and it is carried as a cylinder to an area of shallow water, where it is submerged and allowed to soak. After a time (duration unknown), it is removed from the water. It can now be unrolled to lie flat. It is flopped onto a low, live fire to soften further. It chars somewhat in the process. Removed from the fire, it is folded in half lengthwise, but only at the two ends, the section amidships being allowed to sag open. The ends are held between pairs of vertical stakes which are lashed tightly together. The stern is left square, and it is sewn several inches inboard of the end with tree fibers -- perhaps the same ones that were stripped off the bark before it was removed from the tree? The bow is cut down to a "ram bow" shape. Starting perhaps 2 to 3 feet inboard of the front end, the top "gunwale" edge of the bark is cut in a downward slope toward the front. This is also sewn with bark fibers. A simple stopper knot is tied at the end a bundle of fibers, then sewing proceeds in a simple in-and-out pattern. More fibrous material is shoved inside the seam, and this may serve as a kind of caulking. Just aft of the stitching, the top edges of the bark are pushed outward and down. One or two simple wooden poles are lashed across the boat amidships to hold the hull apart, and shorter ones ("stretchers") are set well below the sheer well into the ends to provide some width and buoyancy there. The ends of these "thwarts" bear directly against the inside of the bark. The midships thwarts are quite long, the result being that the boat takes on a substantial sheer, while midships it is very shallow -- just a couple inches of freeboard when the paddler sits amidships. The run is rather flat aft, and it rises well above the waterline forward, but I could not tell how the bottom was shaped thus. The leading point of the "ram bow" is thus well above the waterline, and this is supposed to allow the boat to pass more easily through the long grass that grows in the swamp's shallow waters. The design is unique to the Arafura Swamp. 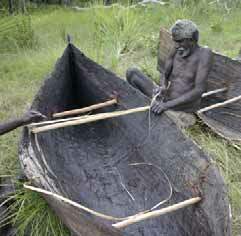 The canoes are decidedly "primitive" -- i.e., of extremely simple construction. The stiff bark is itself the canoe's only structure. They have no gunwales, no ribs, no internal strengthening of any kind, other than the simple cross-pieces whose purpose is only to hold the sides apart. 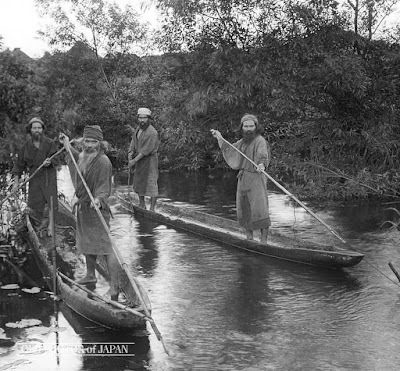 In the film, actors propel the boats in swampy areas by poling from a standing position. In open water, they paddled, seated amidships, with a small one-handed paddle in each hand. Some of the actors paddled with both hands moving together, typically leaning their torsos forward for the "catch" and leaning back during the stroke. This looked strenuous. Other actors paddled the two hands alternately, maintaining a steady motion like swimming, and this looked much easier to maintain over long distances. On the set-up screen of the DVD I rented from Netflix, the scene shown above was shown, in which the ten canoeists paddle for a couple minutes across a stretch of open water. I repeated this scene over and over, perhaps 15 or 20 times. Although it's just a movie, and its accuracy is dubious, it had an amazing, mezmerizing sense of authenticity -- it really felt like one was watching pre-contact indigenous canoeists on a hunting/gathering trip.